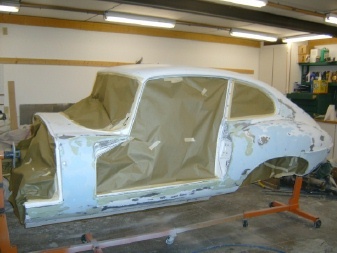 The restoration of the 67 E-Type is moving ahead slowly but surely. Bodywork on the cockpit shell is reaching that magic moment when the color coat will be applied. But it is certainly a truism in bodywork that shooting the paint is the easy part, it’s the prep work that is the killer. To recapitulate, I started with a New York car that had seen its share of winter and road salt. Much of the underside of the car was rusted and had to be repaired. Many pieces of custom sheet metal have been cut, formed, and welded into place of the last months. First, I took the car down to bare metal using 80 grit sanding disks on relatively flat surfaces and using sandblasting on the more contoured surfaces. Certainly, once you identify rust you probably want to go with sand blasting, as this will clean out the corrosion and let you see exactly what you are dealing with. 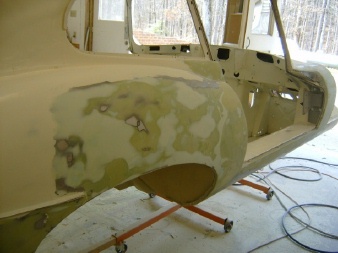 Once I had the car stripped, I laid down a coat of epoxy primer, just to stabilize things from further corrosion. Next, I cut out the areas that were totally rusted. From that point, it was the long road of cutting, shaping, and inserting patch panels. I know that a few artisans out there are capable of welding in a perfect patch that leaves a smooth surface ready for paint. I am not one of those artisans. My skill level will get the surface of the patch close. I strive to leave it at or a little below the finish surface so that I can build up the final surface with body filler. Modern body fillers have come a long way in quality and one shouldn’t be scared of using them. Try and keep them thin (<1/8″) and there shouldn’t be any long term issues. In the last few months, I have been working on my body filler work, striving to get the surface contours right. It is best to lay the plastic filler down on bare metal roughened up with 80 grit sandpaper. Epoxy primer roughened with 80 grit will also accept filler. Perform your rough work with a standard filler. I use Evercoat Rage, which is a premium filler. You will only be using one or two cans so buy the best. You can shape this filler with fairly coarse sandpaper, so that the cutting will go fast. It’s really important to have a compressed air hose nearby to blow the dust out of your paper on a regular basis, otherwise it clogs very quickly. After you get the surface close to its final form, a similar product generally called a glazing putty is used. This product is a little more fluid. The idea to place a “skim coat” over the final surface to fill in rough scratches, pinholes, and provide a seal. Again, buy the best product your supplier sells, you won’t be using that much. When you are done the surface will have a mottled appearance, since each type of filler has a different color. You’ll want to feather out your skim coat with a finer paper such as 220 or 320. Now you are ready to apply more epoxy primer/sealer. 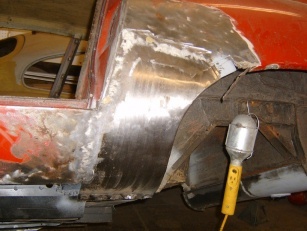 Invariably, your filler work will expose areas of bare metal. These are your high spots. You want to sand down to the high spots in the metal. That means your filler is as thin as possible. I sanded the entire car with 220 paper in preparation for this step. Be sure and blow off the surface with the air hose as you go. This will expose pinholes, which is exasperating, but its better to fill them now with more glazing putty then to find them when you are putting down the color coat. I find that I have to force a dab of glazing putty on the end of my finger into the pinholes. When it dries, sand it smooth. 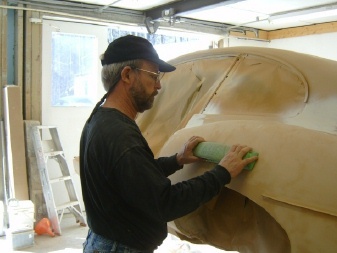 When you are satisfied that your body filler work I complete, it’s time to mask off the areas of the car that you don’t want painted. Don’t underestimate the time it will take to do a good masking job. It will take you several hours to do it right. Finally, wipe down the surfaces to be primed/sealed with a prep wash or pre-clean to remove all oils and sanding sludge. Now, finally, you can read the directions for the epoxy primer/sealer and prepare your mix. I like to use scales to mix my paint. All the manufacturer’s spec sheets give the commutative weights of the various paint mix components. Using a scale takes all of the guess work out of mixing paint. Shoot the entire car with a coat of epoxy primer/sealer. This coat will dry in about 30 minutes. I used white primer. If you are able to select all of your primer and filler products in a shade similar to your final color, coverage of the color coat will be easier. Also, if your paint is chipped, it won’t be as noticeable. Plan on the next step, the application of the primer/filler, to occur within 24 hours of shooting the primer/sealer. This allows the two products to bond chemically. 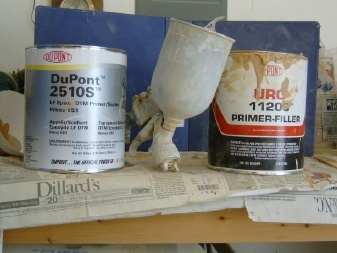 The primer/filler in the Dupont brand is called URO. This is really great stuff. It goes on well and sands sooo easily. The idea here is that you are going to lay down a lot of coats. I started with 5 coats. Then you are going to sand most of it off! Right back down to those high spots that you had previously identified. In this case, I used the tan primer/filler so that when I reached the white primer/sealer, I would have an immediate visual clue. STOP when you see white. Any further sanding will expose bare metal. This process is generally referred to a “block sanding”. Large sanding blocks are used that force the surface to be level. What you will see is that while much of the area sands to a smooth finish (we’re using 220 paper here), the low spots remain untouched and dull. Once you’ve sanded down to the highest point, you have to stop and apply more primer/filler. This will build up the entire surface but in particular the low spots. The next time you sand, the extent of the low spots should be diminished. Repeat this process until the entire surface sands uniformly to a smooth surface. At that point you have a truly level surface! Now don’t get me wrong. You can’t fill in serious low spots with paint, that’s the work of the plastic filler or glazing putty. I don’t’ know the exact numbers but I would say that 1/64″ is the maximum thickness for the primer/filler. And don’t cheat. You have to use a sufficiently sized sanding board to give you a true surface. In the following picture I am using a 15″ long semi-flexible board that I bought from Eastwood. In a close-up view, you can see the darker areas, which are the low spots. At this point I’ve shot about 10 coats of primer/filler, with most of that sanded back off onto the floor as dust. But I am getting close. Next article, I hope to be able to discuss application of the color coat!